I think my exact words were “This f-ing rocks!” after my first bite. Pardon my French, please. But seriously, this was the best dessert I have put in my mouth in ages. I just don’t know how to better explain how good this was than by my foul-mouthed comment above. The peaches were sweet and flavorful and they held their shape even though cooked for 1 hour, much to my surprise. Many of the blueberries burst open and blended in beautifully with the flour and sugar, creating a delectable and thick filling. And don’t even get me started on the crumble!! This crumble topping was without a doubt the best one I’ve ever had. All put together, stone fruit and berry heaven. 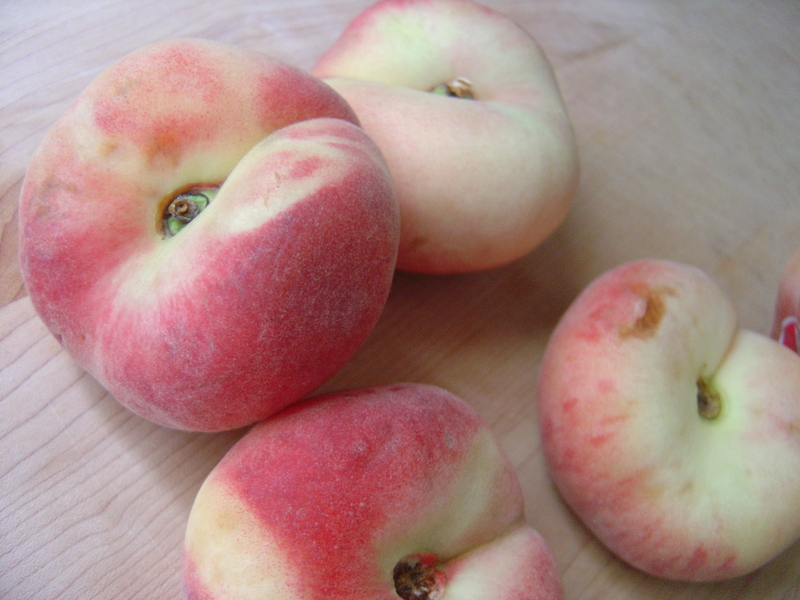 I know there are so many different type of peaches to choose from this time of year but I used donut peaches which are also affectionately known as UFO peaches because as you can see above, the center of the tops and bottoms and of these peaches are concave giving them the illusion of looking like donuts or well, UFOs. I chose these funny looking fruits because they smelled the best out of any of the peaches I sniffed at the grocery store this afternoon. Unfortunately, local peach season doesn’t happen here in CT until August so I had to choose carefully in order to find nice ripe ones. You’ll see that I baked my crumble in one dish rather than ramekins. I planned to halve the recipe and use 3-4 ramekins but bought more peaches than I needed for a half recipe. So I used 6 donut peaches (or about 4-5 larger peaches), and the full amounts for the filling and crumble. There definitely wasn’t too much of the filling and crumble in comparison to the fruit though! And according to the Musings post on the BB blog, more filling was needed anyway. 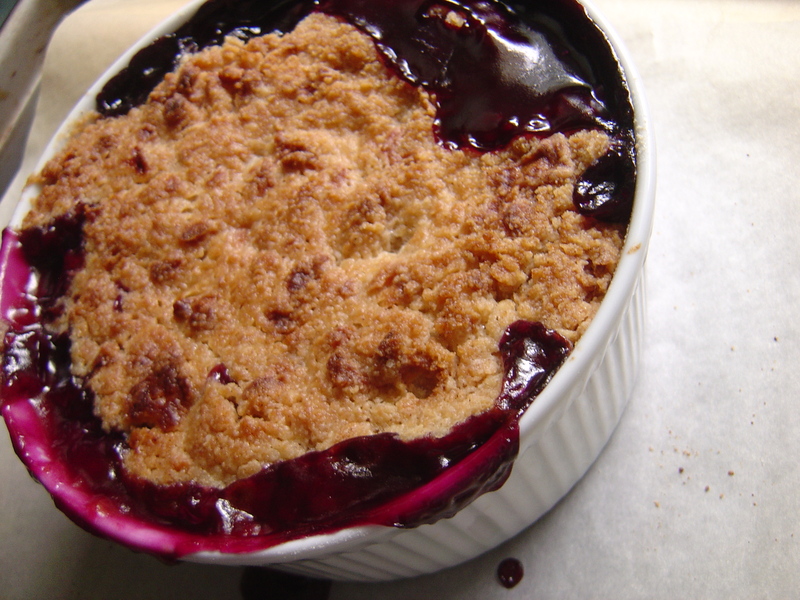 Thus I baked my crumble in an 8″x8″x4″ soufflé dish. And because there was so much crumble, filling and fruit in this smaller dish, I baked it for 30 minutes covered lightly with a piece of aluminum foil, then 35 minutes uncovered, then I turned the broiler on for about 3 minutes to finish browning the top. Many thanks to Aggie of Aggie’s Kitchen for choosing this perfect summer dessert for the Barefoot Bloggers to try out this month!! Be sure to head over to the BB blog and check out how much everyone else loved this one! Looks beautiful! I could really go for a piece right now! We were pretty excited about our crumbles too! So happy you enjoyed it!! Your pictures are beautiful! I was surprised, too, about the peaches staying so firm! I thought they’d cook to mush, but this dessert was awwwwwwwwesome. Great pic’s, this looks delish! This and your recent recipes all look wonderful! Awesome crumble and so summery! I’ve been on a slight commenting hiatus with my busy schedule lately… but it’s great to catch up and see what’s cooking in your kitchen!